WHAT'S UP THE PIKE: Silver Spring woman makes nit-picking a profession; Burtonsville children's singer makes Juno soundtrack; Woodside pastor wants Falkland Chase town down. 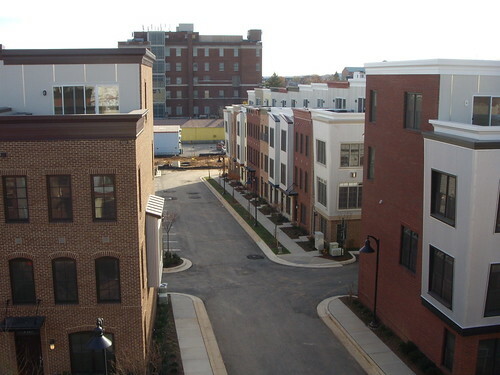 It doesn't take long for the edginess to grow tiresome at Arts District Hyattsville. This is part THREE of a series on Hyattsville, the "Silver SprUng" of Prince George's County. For more on Hyattsville, check out this slideshow of Arts District and the Silver Spring Scene's "Sister to the East" report. After visiting the Arts District Hyattsville sales office, I'm pumped to check out what kind of homes are offered at this groundbreaking new community in Prince George's County. From the outside, Arts District houses try to throw the traditional townhouse mold out the window. Cornices and window frames are painted in bright colors - greens, reds, blues and purples. The windows themselves are huge and without the fake muntins that, to me, scream "McMansion!" Then there's the metal: steel-clad turrets, a fun play on the age-old rowhouse façade and a conscious tribute to Franklin's, the popular restaurant a few blocks south. If you look at a house by itself, it's easy to say "I can imagine some edgy, creative types living here." But that's just a single house - which in any real D.C. rowhouse neighborhood would look ridiculously avant-garde. In Arts District, you'll see that house repeated over and over again on each block, with another steel turret at the corner, beckoning you to see a few more on the other side. Has the industrial aesthetic finally gone tract-house? It seems to be the case, and it's a shame: I really liked the steel when I first saw it at Franklin's. Inside, all of the faux-loft cliches have taken hold. Modern couches rest against exposed-brick walls, no more authentic than the brick veneers outside. Strategically placed easels - holding half-finished masterpieces to be finished after the imaginary occupants return from Pla-Za Art - rub elbows with desks that appear to have been bought at a fire sale held by the 1960's. Or Ikea: it is only fifteen minutes away on Route 1. And, of course, there's more metal: steel countertops, steel railings, steel fixtures in the bathroom. Bring your refrigerator magnets! 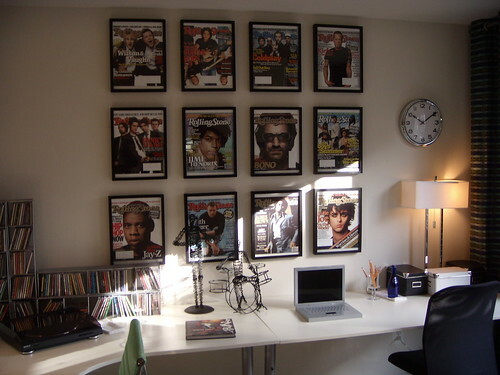 Rolling Stone covers line the wall of a den in the Adams model. All of this is set to a soundtrack of upbeat music piped-in from God knows where, turned down low enough so I couldn't pick out an artist or song. But looking at the covers of Rolling Stone magazines that plastered a wall in the den of the Adams model - the smallest of eight models offered - it could have easily been Coldplay, Green Day, or even Panic! at the Disco. Hip enough for the svelte young couples I followed around, but light-years away from the vanguard where this development has positioned itself. And that brings me back to the Talking Heads poster. I'm in the fourth-floor bedroom of the Calder model, the largest of the decorated houses and, at nearly 1,600 square feet, a tempting upgrade for Silver Springers eager to ditch the apartment but unable to afford a spread in Woodside. There's a snazzy black guitar resting by the bed, and keeping David Byrne company on the bright yellow walls are the Pretenders, the Cars and Spike Lee. A backpack on the floor suggests this is a kid's room, albeit one who's obsessed with the 1980's. But I can see myself in here, entertaining my hipster friends on the leopard-print couch in the adjacent lounge. 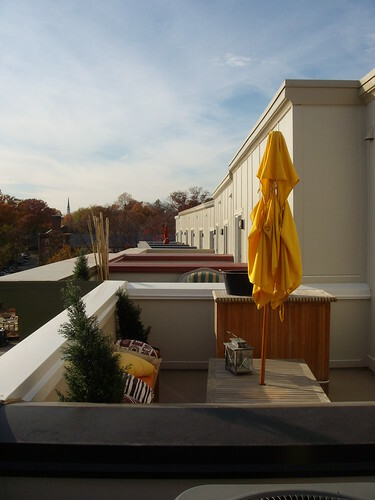 I walk out to the roof deck its view of the rolling hills of Hyattsville blocked somewhat by a large brick building whose history or purpose seem vague at best. On either side of me are the terraces of every other house on this street, most of which are already occupied. Nobody's out: it's cold outside, and after all, the partitions between them are barely waist-high, meaning that everyone will be in everyone else's business. I consider jumping over them and into a neighbor's when I realize that two houses over, in the deck of another model, there's a family staring at me. A mother in a drooping black coat and three kids, ranging from pre-school to middle school, all of which look bored as hell. "This is pretty close, huh?" I call over. The mother laughs. "Yeah, it is. They'll have to put up some fences, or something. I can't do this." The Blake model, seen as an overdecorated show house, above, and as the real thing, below. To see who can actually live here, I head a few doors down to an Open House being held that afternoon. Realtor, Quan, motions me in from the sidewalk. "You wanna see the house? Come in, come in," says Quan, a heavyset man with a beret and a boisterous demeanor. He leads me into a dark, narrow hallway. A coat hangs from the lone hanger in a closet, and a door leads to a garage. "Is this a two-car garage?" I ask him. "Yeah," he says, rubbing his chin. "It's very long, so it could be a two-car garage, but you could also fit a limo in there." He nods, awaiting my approval, and I nod in response. Quan explains to me that the owner is an investor renting the house out until a buyer is found. "So, which model is this?" I ask. 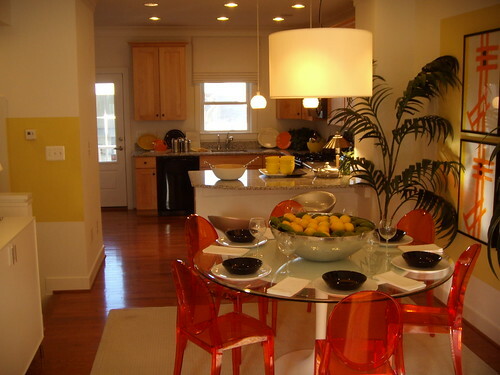 (It's hard to tell because the three decorated houses have roughly the same floorplan.) "Um . . ." Quan trails off, his face turning blank. Breathing heavy, he responds, "I'ma have to see about that. Let me call this number; go take a look at the rest of the house and I'ma give you that information." This is a house someone actually lives in, so I have to lower my expectations, but I'm still depressed. With the blinds down, I can see just how small the rooms are. The only signs of occupancy are an overstuffed couch and a television; old board games stacked up in a closet; a photocopied picture of a smiling couple on the refrigerator. It's a far cry from the Bertoia wire chairs and slam poetry books found down the street. 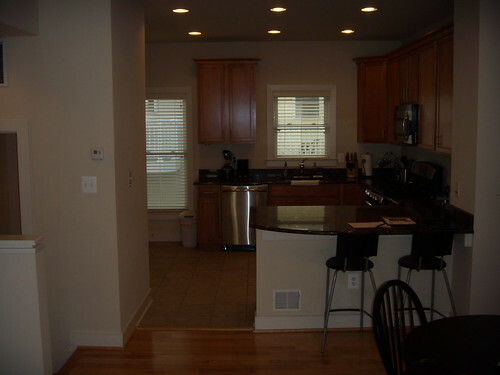 There isn't even any steel: here, it's all beige carpet, wood cabinets and granite - yes, just granite countertops. It's small touches like countertops and deck partitions that make you question just how practical the Arts District's main conceit is. Can you foster a sense of community when neighbors are forced into uncomfortably close contact with each other? And for such a high cost - prices start in the low $400's - can you draw creative types to houses that, at the end of the day, aren't much different from anything else on the market? And that's the point of Arts District or any development from inner-city condos to country club estate homes: selling an idealized lifestyle to eager homebuyers. Except that a country club is a country club, no matter how contrived it seems. You can't fake a vibrant arts scene. Despite its name, the Arts District doesn't seem to contribute much to an artistic community. The Lustine building will provide a place for local artists to showcase their work, and the retail offerings - from neighborhood vendors like the soon-to-be-open Book Nook to more regional institutions like Busboys and Poets - will provide a street life desperately needed in this part of Prince George's County. But when it comes to giving actual starving artists a roof over their heads, the only way this development will help is if its well-off residents buy the works of individuals living down the street in Mount Rainier, in the real Arts District. While EYA may repeat its past successes in Silver Spring, Wheaton and elsewhere - drawing people to downtrodden, previously-ignored neighborhoods with a lot to offer - whether it can do more than that for Hyattsville has yet to be seen. It's interesting to me that all of these apartments come already "artistically" decorated. You would think that if they were really trying to develop an artist community they would start with more "blank canvas" style homes and put funding into building a community and helping the artists create the homes they would like to have. I wonder what urban planners and builders would have to say about that. It's called curb appeal and resale value. That's why you have housing associations that say you can't put a 15ft pink elephant in your yard. Who wants to live next to that? Also, if they paint their house lima bean green with orange accents, that might turn off some potential buyers who may not be as arts as the previous resident. I say give it time. While it may not seem like an "authentic" arts district, those things take time to grow. That can take 10 to 20 years. Once more people move in, then there will be greater input as to how the community is shaped from here on out. Concerning the homes; a house is a house is a house. Everyone has their likes and dislikes. People will be free to change things as they wish once they get settled in. 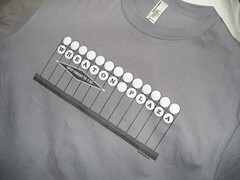 As far as the closeness of the decks, has anyone been around capitol hill? Georgetown? Yet, those people seem to be okay with it. If people want privacy, they shouldn't be buying rowhomes. I agree with jeuill...you have to give this time. Moreso, you have to give the developer credit for trying to do something different. You would be screaming much louder and more cynically if they put up (yet another) faux colonial townhouse development that can be seen by the hundreds of thousands in this area. You say they lack authenticity...but exactly is authentic? 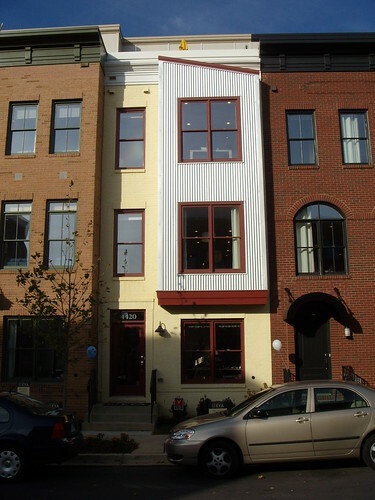 In DC, authentic often means "old" and since these are brand new homes, creating "authenticity" is impossible...so they did the next best thing...re-created it as best they reasonably could within cost limits. Personally, I think this project is brilliantly conceived and marketed, though it is coming online at a poor time in the housing market. Well, of course a new development isn't going to be "authentic" in terms of looking and feeling like a real place. It's the same argument people use for Downtown Silver Spring, and I say: give it time. The goal of the Gateway Arts District (of which this development is considered a part) is to revitalize inner Prince George's through creating a thriving arts community, which this development doesn't really contribute to. It just uses the name and the idea to sell houses, which I think is inauthentic. 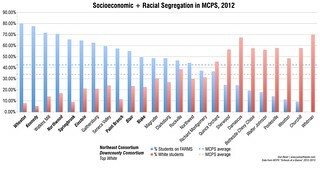 I don't think Arts District Hyattsville shouldn't have been. From a planning and design standpoint, it is lightyears ahead of anything out there, though it still has a long way to go. Why shouldn't they use "arts district" as their marketing theme to sell houses? Frankly, other than this development and a few other new places, the PG initiative is the only exciting thing going on in this corridor. The initiative gets a significant contribution (if not entirely tangible)because just by being there the development says to prospective artists and businesses: "it's safe to be here and invest here". Keep in mind also that there probably was no public tax contribution to the EYA project, where every project in the PG initiative is subsidized. They are doing it backwards. You attract artists (like Greenwich Village did), with low rent. It then gets a name, rent goes up, arists move elsewhere. Artists do not live in pre-fab, up scale communities. They live in nasty little dives, as economics dictate. Happy Holidays Dan. Keep up the good fight, and thank-you for keeping us informed. my thought on seeing this project is that it does a good job of bringing together the goals of the Gateway Arts District, principles of new urbanism, and economic reality into account in a way that delivers an authentic community development cornerstone for the area. it's true that that the rowhomes might still be too expensive for most artists but the rowhomes will attract buyers of art that will help contribute to the overall mix needed for a successful arts district. also the prices of the condos and even the rowhomes on a $ per sq ft basis are much more affordable than other new developments in the region. 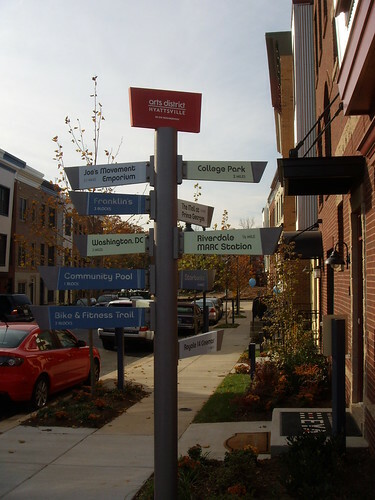 the towns stretching from the district line to college park offer a big range of affordability so that arts district hyattsville is just one part of the bigger mix. i'm rooting for the project and for the Gateway as a whole - i bet that it will prove to the most ethnically and economically diverse corridors in the region in a few years. that is something we really need in the DC area.